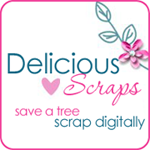 Delicious Scraps: New CT Member - Francine and a Gorgeous QP! New CT Member - Francine and a Gorgeous QP! Click on the previews to get the kit!